Roasted Garlic Eggplant Lasagna Boats w/Spicy Italian Chicken Sausage. So this is how I am dealing with it still being summer and all the fall-like weather we have been having. 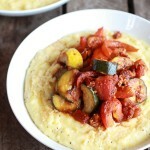 I am making summer foods the cozy way – and loving it so much! I should add that I really love cozy foods at any time of the year, but at least this way I am still getting my fill of my beloved summer produce! Actually, the weather here the last two days has been pretty nice, but at the time I was making these it was raining, dark and forty degrees, so I think you can understand my desire to do some roasting in the oven. I am sorry if it is blazing hot where you are (lucky!!) and you cannot even fathom the idea of turning on the oven. To be honest, I do not even know what that feels like, so it is hard for me to relate (Ok, I did go to Florida this summer, but my grandma keeps the house VERY air-conditioned so it is not like I was suffering from the heat while inside). Where I live, it is never too hot for a little oven action. Did you know that none of the houses or businesses are even built with air conditioning? Yep, at least I never have to worry about going anywhere and having the A/C blasting out too cold air on me. Up here we just open up the windows and a cool mountain breeze will take care of any excess heat. Ok, now you are all probably hating me because you are sweating your butts off. I am sorry, maybe you could send your heat my way and I’ll share some cool mountain air with you? Wouldn’t that be nice if we could work that out? Really though, these cute little boats are chock full of garden veggies. 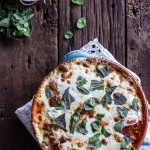 They are a lot lighter than your typical “it’s mid winter and all I want is an extra cozy, extra saucy and extra cheesy lasagna”. I will even go as far as saying these are extra healthy. That is of course if you consider a little cheese healthy, which I do. This was my first time really roasting eggplant, and you know, I think eggplant is really starting to grow on me. Once it’s roasted it takes on a whole new life. Then I piled on a delicious meat sauce with spicy italian chicken sausage. One of my little secrets about meat sauce is that I pretty much always use a sausage instead of just plain beef. I find that the sausage adds so much more flavor and I always like a little spice too. These do take a little time to make, but it is mostly time spent roasting. Nothing hard or complicated about them. I know that some people are pretty serious about salting their eggplants before cooking, but I just did not feel like taking the time to do that. If you would like to, go for it, but mine turned out great minus any pre-soaking/salting. Also, if you really cannot get your head around the idea of turning on your oven, grilling the eggplant would be a great idea. I have never tried it, but you can probably even wrap the garlic in foil and grill that as well. Maybe just rotate it 3-4 times throughout grilling to make sure one side doesn’t get burnt. Then you can cook the sauce on the stove and melt the cheese by placing the boats back on the grill for five minutes or so. That should do the trick. So there, then you will not even have to turn the oven on. A solution for all. These are definitely a meal on their own, but I served them with a side of whole grain pasta and a simple summer salad. Kind of perfect for entertaining because they are fun, easy and you can prepare the boats in advance. Just warm them up to melt the cheese prior to serving. If some of you eggplant lasagna boat eaters really aren’t into chicken, try swapping extra veggies and lentils into the sauce. Maybe even add some extra spices and you’ll have the perfect vegetable eggplant lasagna. Ya! Man, I am just full of alternatives. It’s that whole pleasing everyone thing, I like to do it as much as possible. I just can’t help it. No lie though, these are so stinkin good. And really, I just want everyone to be able to enjoy them like I really do!! Parmesan Roasted Garlic Eggplant and Spicy Italian Chicken Sausage Lasagna Boats. Rub the cut sides of the eggplant with olive oil, salt and pepper. 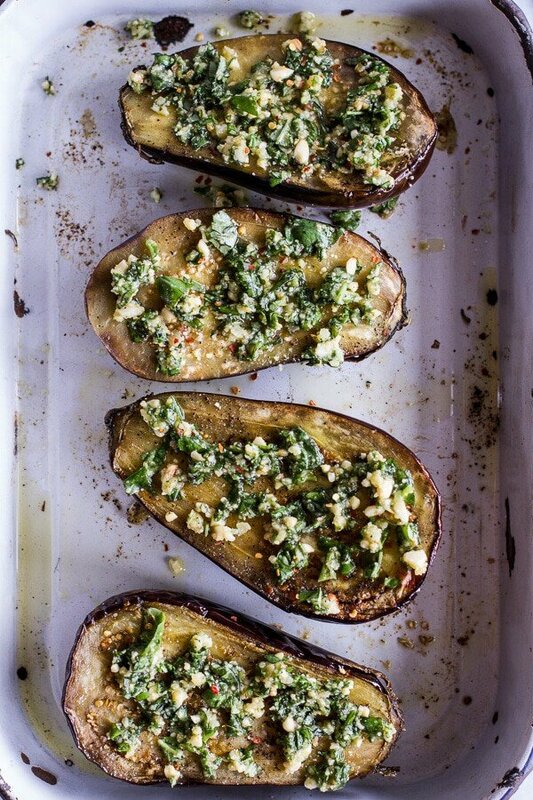 Place both the eggplant (cut side down) and garlic on a baking sheet. Roast both the garlic and eggplant for 30-45 minutes, or until the garlic is golden brown and the eggplant is soft. Meanwhile, heat a large skillet over medium heat and add a drizzle of olive oil. Add the sausage and break apart into small pieces. Brown the sausage all over, about 5 minutes. Remove the sausage from the skillet and set on a plate. Add another drizzle of olive oil to the skillet, add the onions to the pan. Cook the onions, stirring occasionally, until they are wilted and lightly caramelized, about 5 to 7 minutes. Add the red peppers, zucchini and thyme to the pan and cook, stirring occasionally, until the veggies have softened, about 5 minutes. Add the canned tomatoes, balsamic vinegar, basil, oregano, salt and pepper, to taste, and cook for another 5 minutes. Simmer the sauce on the stove while preparing the rest of the meal. Once the garlic and eggplant have roasted, squeeze the garlic out of the paper skin into a small bowl and mash well with a fork. To the garlic add 1/4 cup chopped basil, crushed red pepper flakes and the parmesan. Flip the eggplants over and rub them all over with the garlic mix. Drizzle with olive oil. Place the eggplant back in the oven for about 5 minutes. Remove the eggplant and top each half with the meat sauce. Try to stuff the meat sauce into the middle of the eggplant. Layer on the slices of mozzarella cheese. Place back in the oven for 10-15 minutes or until the cheese has melted and the sauce is bubbling. Serve warm with fresh basil and a side of pasta if desired. 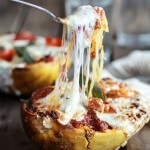 Now can we just make these and pretend it’s Friday already (sorry, lasagna just seems like a Friday meal to me)? Well at least we’re almost there – happy Thursday! Quinoa Crusted Baked Three-Cheese Zucchini and Eggplant Parmesan. 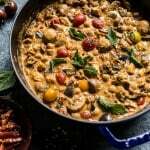 Simple Almond Chicken, Chickpea and Eggplant Curry. 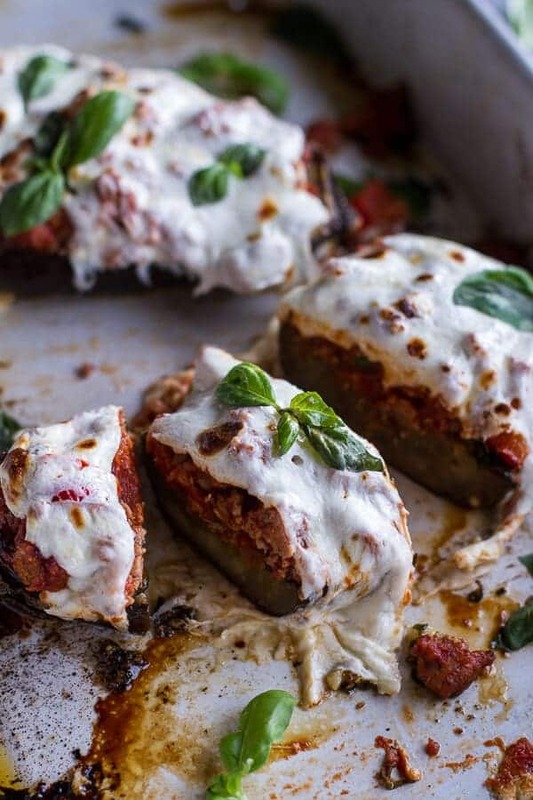 I love eggplant and I never thought to do them this way I am so going to try this. I got some small eggplants in my CSA so I could make them into individual portions which would be cute. Thanks for the great recipe. Smaller eggplants is actually what I wanted, but I could not find any. Yours will be so cute! 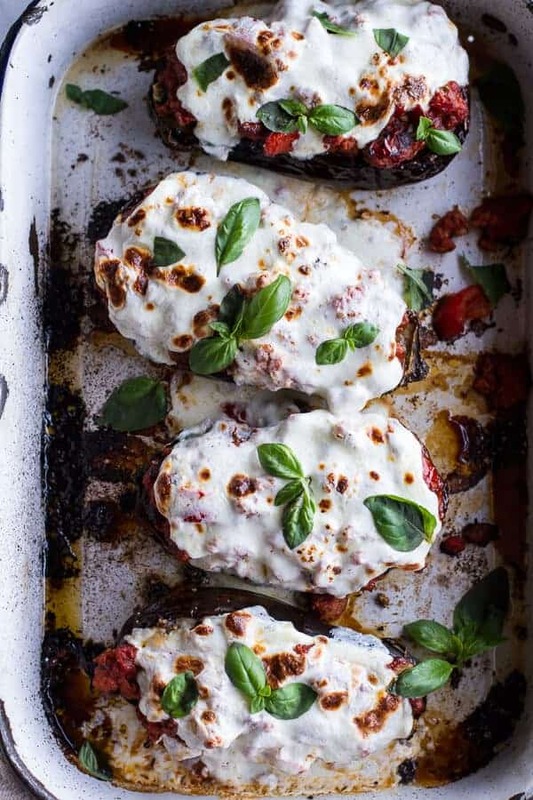 I can just imagine the flavorful goodness of these eggplant lasagna and eggplant has never looked so GOOD! Thank you for the recipe!! This looks incredible and the combo of flavors is spot on! What a tasty way to enjoy eggplant! I can’t WAIT to make this! I love the roasted garlic mix spread on the eggplant under the sauce, yum! And yep, I always use sausage instead of beef in my red sauce, so much BETTER! So much better! Glad you agree! Love this idea to use EGGPLANTS!! Brilliant!! 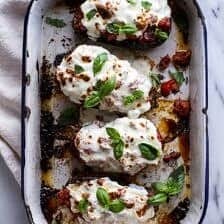 I never know what to use eggplants for besides eggplant parm – so this is definitely another alternative! Yea it’s definitely still warm here although it’s been cooler which is nice so that I can open windows and turn off the AC int he morning and night. Still too hot mid-day though. 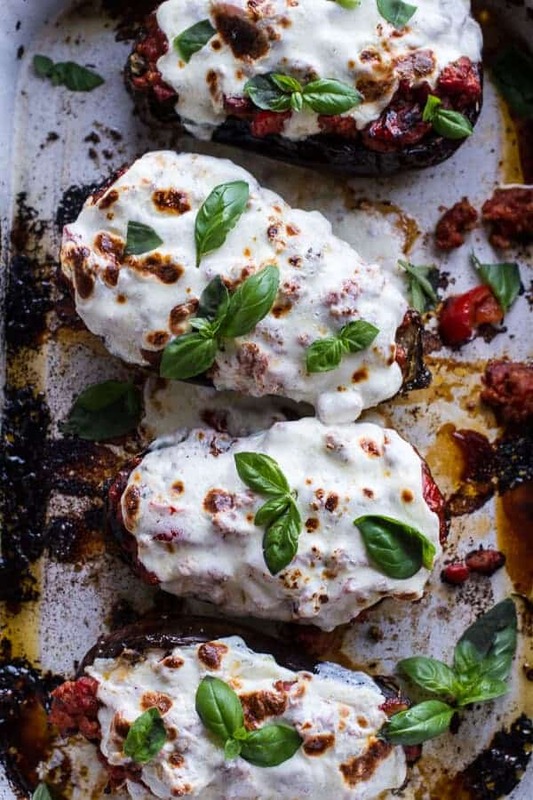 Love these eggplant boats! 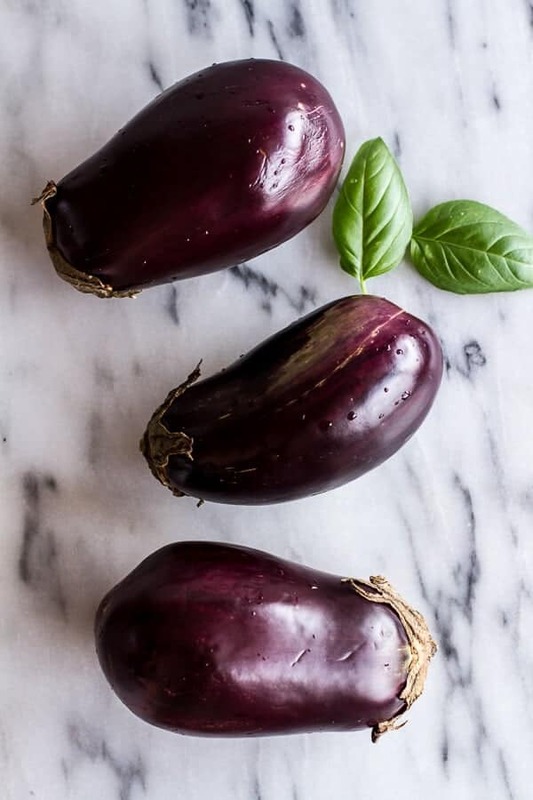 There was an eggplant in our CSA share this week – now I know how to use it! Love this idea, T! Looks so delicious! I can’t wait to make it! I adore eggplant! These look so fantastic. How is it that I pretty much want to make every single recipe you make. I’m kinda starting to wish I just lived at your house! lol. I love ANYTHING that involves eggplant!! This looks so delicious Tieghan! 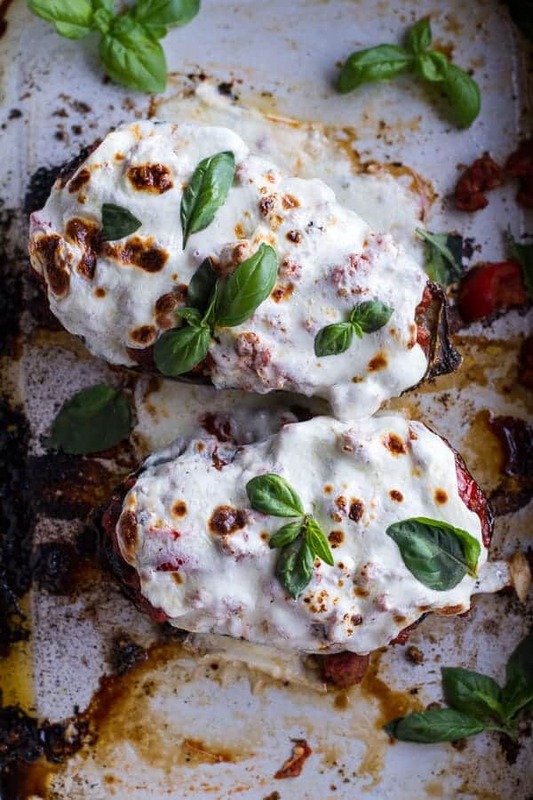 You sold me with the eggplant and all that mozzarella – two of my favorite savory foods for sure!!! And I’m totally jealous of your breezy mountain air now but not so much of your crazy-cold winters! Thanks Alexandra! An yeah, our winters seem to last forever! 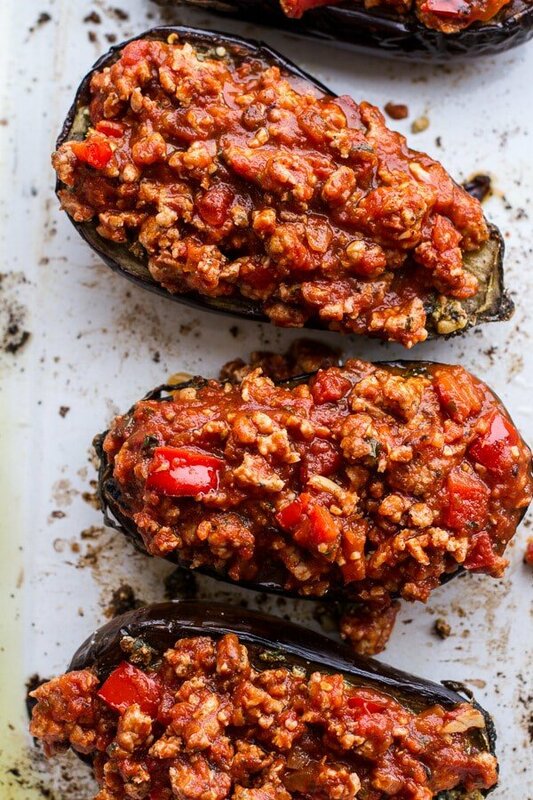 I love stuffed eggplant, this is just what I’m craving for dinner! Love that pic of overly stuffed eggplants!! So so good! I just called my husband over to look at this. We are so making these boats for dinner tomorrow. Perfect! In the oven! Each component is delicious can’t wait to taste the finished product! Ya!! Hope you love this! Thanks Cindy! I would gladly devour any eggplant that was served to me like this!! 🙂 Everything about these lovely little boats is amazing! This recipe takes awhile but each component is easy. I was excited for the roasted garlic but I think the sauce overwhelmes it and you don’t taste it. Tasty dish but I don’t think I would make it again. Thank you for all your recipes. I’m new to your blog and also new to the blogging world! Your recipes and photography are so creative and inspiring! I have a bunch of eggplant about to come out of my garden. Looking forward to trying this recipe! Lovely, i love a nice spicy tomato sauce. Thanks for sharing this. Love this recipe!! Have made 3-4 times now and its always a crowd pleaser – thank you for sharing your delicious recipes!! That is so awesome! I am so happy this has been so good for you!! Thanks so much Lesli! 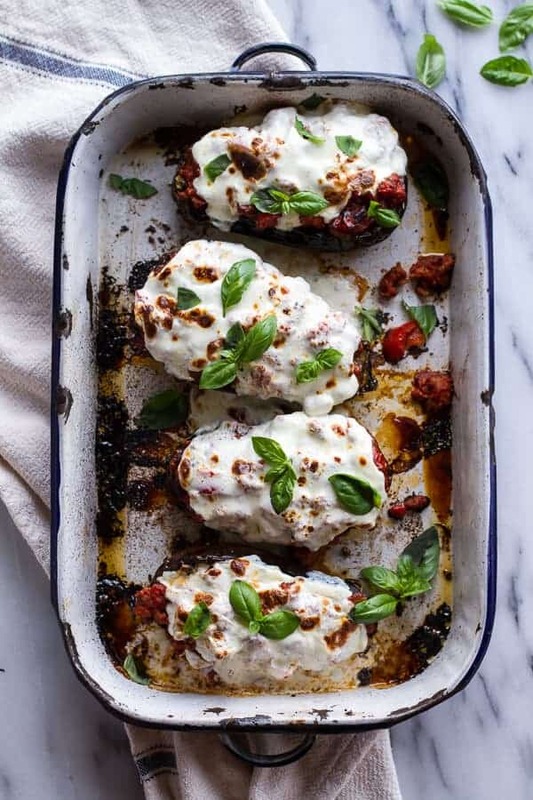 This recipe is delicious, never knew how good eggplant was. Thanks! So happy you enjoyed! Thank you! I’m looking for to trying this tonight. Just two questions. For the red peppers, is that red bell peppers? Also for “1 ounce can diced tomatoes 28” is that 1 can that is 28 oz of diced tomatoes or really just 1 oz of canned diced tomatoes? Made these tonight and they were amazing! That roasted garlic adds so much flavour to the eggplant – I’ll definitely be using this trick with other roasted veggies. Thanks for the recipe! Thank you so much Holly! I am so glad you loved this! In the beginning state cut off the top and bottom of the eggplant then cut the eggplant lengthwise. Planning to serve this with a side of pasta. Will the recipe have enough additional sauce to spoon over the pasta? If not, want is the best way to adjust? Thanks! Ok I may be missing this but please correct me if I am. Do you just slice the eggplant crosswise and not cut off the tops? You don’t say to add back in the sausage can I just leave it in? Why take it out of the pan? You say to add 1/4 cup basil to the mixture for the eggplants but in the recipe it only says a tablespoon. Thanks for the clarification. I am making it now hopefully it comes out ok! Do you use diced tomatoes in sauce or juice? I got juice and my sauce doesn’t look like yours 🙁 you must have diced tomatoes in sauce. Shoot!